Should the U.S. enforce more explicit restrictions on monopolies, or can innovation and democracy alone mitigate the pervasive effects of monopoly power? A panel of historians and economists at the recent Stigler Center conference on concentration in America discussed the historical evolution of this debate. 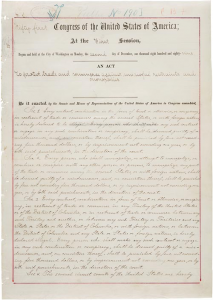 The first page of the 1890 Sherman Antitrust Act.